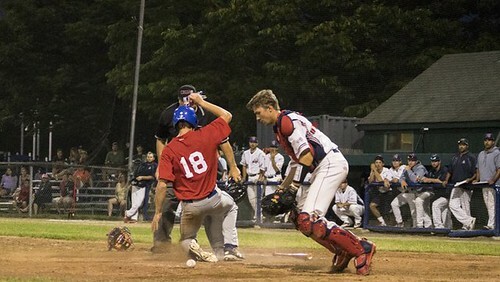 CHATHAM — Tristin English (Georgia Tech) stepped up to the plate in the bottom of the fourth in Friday’s game between the Chatham Anglers and the Yarmouth-Dennis Red Sox with the game tied at zero. After his at-bat, the scoreless game would be no more. For the third time in as many games, English hit a solo home run — this time into the forest beyond the left field fence at Veterans Field. The home run gave Chatham (7-6-2) a lead it would hold onto the rest of the way, as they defeated the Red Sox (8-6-2), 5-2. Two at-bats after English’s home run, Chatham doubled its lead. Drew Mendoza (Florida St.) sent a Karl Kauffmann (Michigan) pitch deep onto the hill in right field for the Anglers’ second round-tripper of the game and his first home run of the season. Chatham continued to add to its lead in the middle innings. In the fifth, English singled with two outs, then stole second base to put himself in scoring position. After fouling off three straight pitches, Colin Simpson (Oklahoma State) blooped a single over the head of Christian Koss (UC Irvine) to score English. Adam Fogel (Hawaii) doubled down the left field line with one out in the sixth before Ben Ramirez (Southern California) blooped a single to score Fogel, extending Chatham’s lead to three. Fogel single-handedly added an extra insurance run in the eighth. He first reached on an error and then stole second base. During the next at-bat, he broke for third and Vito Friscia’s (Hofstra) throw from behind the dish was off target and Fogel scored easily. Adam Fogel posted his best outing of the season, tallying two hits and two runs scored. Jack Conlon (San Jacinto) got his third start of the season for the A’s, and had his best performance of the summer. He finished his day with five innings pitched, four strikeouts and only three runners allowed on base. His counterpart — Y-D’s Kauffmann — threw 4.2 innings, giving up six hits and three runs. Conlon, a rising sophomore, ran into trouble in the fifth inning. Y-D’s Zach Zubia (Texas) walked with one out. Then, Koss laid down a sacrifice bunt and beat Ramirez’s barehanded throw, which sailed wide. English managed to knock the ball down, but by the time he picked it, Zubia was on third. Andrew Martinez (UC-Santa Barbara) then roped a line drive to center field, but John Rave (Illinois State) made a great diving catch. Zubia scored on the play to put the Red Sox on the board. Colin Peluse (Wake Forest) replaced Conlon in the top of the sixth. In his first appearance since June 15, Peluse went three innings with four strikeouts. Greg Veliz (Miami) came in for the ninth inning and earned the save with one frame of scoreless baseball. Y-D added its second run in the eighth. Martinez walked to start the frame and advanced to second on a bad pick-off throw from Peluse. After advancing to third on a ground ball, Martinez scored when a Noah Campbell (South Carolina) pop fly just missed the outstretched arm of Greg Jones (UNC-Wilmington). The win for the Anglers broke their three-game losing streak while snapping Y-D’s three-game win streak. In addition, it is the first game all season Chatham has won after an off day. Holliday said the game was very competitive and that he could see the teams developing a rivalry over the season is the competitiveness stays high.